Onion thrips are tiny insects that range in color from yellow to black and are only 1/16” in length. They spend the winter as adults in crop remnants, alfalfa, wheat, greenhouses and weeds along the border of crop fields. Adults lay eggs singly in the epidermis, nymphs feed on leaves, and pupation occurs in the soil. There are at least two generations per year in the Northeast. Thrips have rasping mouth parts which they use to tear open plant cells to feed on plant juices. Populations are favored by hot, dry weather. Heavy rain or overhead irrigation can lower populations. 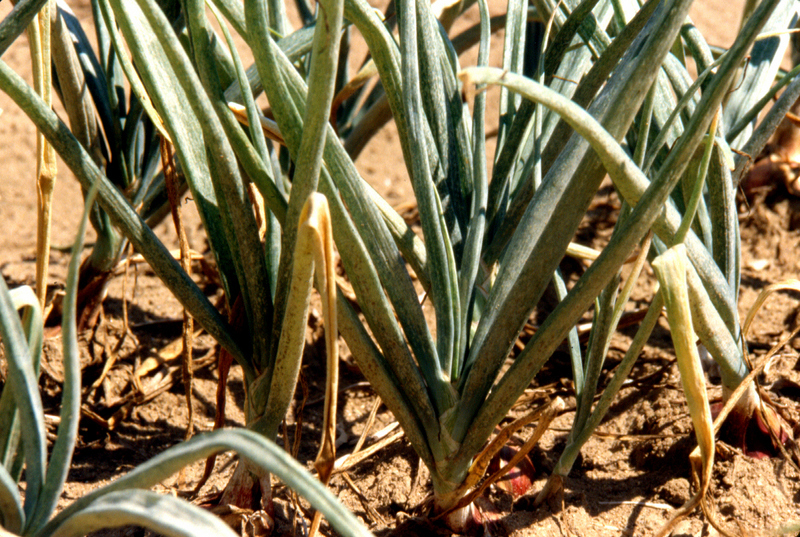 In onions feeding occurs in protected, succulent areas where new leaves are emerging, deep between the leaf blades. Adults and nymphs pierce the epidermis and cell wals and remove cell contents. Damage may appear as silver lines, white patches, tip dieback, curling and twisting of leaves, slowed growth, reduced bulb size and yields, or if severe enough can result in plant death. The irregular and blotchy whitening of the plants is known as 'blast'. Plants are most sensitive when bulbs are forming. Scallions are particularly sensitive because the whole plant is marketed. Healthy vigorous plants can tolerate moderate populations. Thrips damage can increase occurrence of purple blotch (Alternaria porri), as fungus can penetrate the plant through wounds caused by feeding. Scout plants along field margins where infestations build early, as well as checking across the field. Scout weekly to determine if populations are increasing. Look closely between the leaf blades to find the light yellow nymphs or darker adults. Though tiny, they are visible moving about on the leaf when the leaves are parted. Count the number of adults plus nymphs per plant and note number of leaves per plant to determine the average number per leaf. Treat if thrips reach 1 to 3 per leaf. Thrips feeding that occurs during the period of rapid bulb expansion causes the greatest loss in yield. Use the lower threshold during this period, or if expected efficacy of the insecticide to be used is low, water availability is limited, or other conditions reduce the overall health of the plants. Practice good field sanitation at the end of the season. Avoid using last year’s onions for sets. Avoid imported transplants that may be infested with thrips from southern areas. Use straw mulch to deter thrips. Alternate onion rows with carrot rows. Avoid planting onions near alfalfa, wheat or clover, as these crops can harbor large populations of thrips. 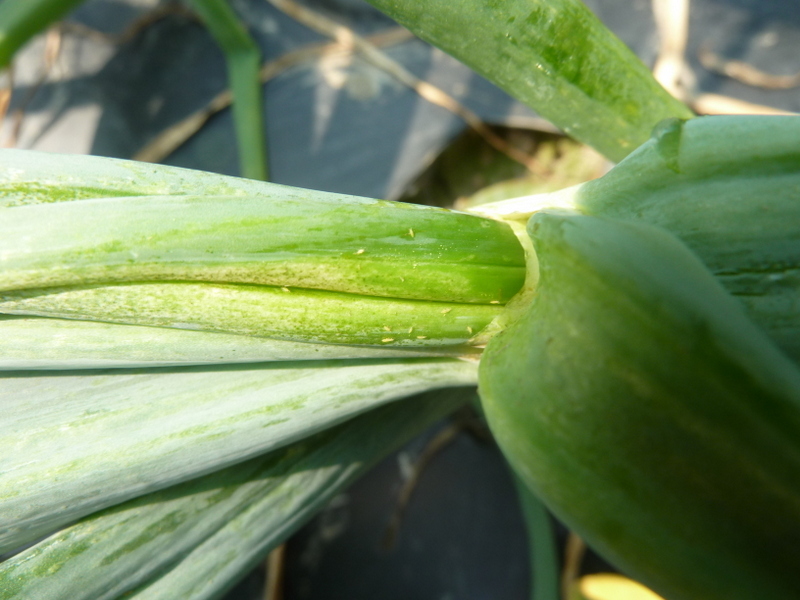 Thrips may migrate to onions when these crops are cut or harvested. Lacewing larvae, pirate bugs and predatory thrips are important natural enemies. For current information on chemical control of onion thrips and pesticides labeled for this pest, please see the New England Vegetable Management Guide website.